Editor’s Note: We brought David Stockman — Ronald Reagan’s former budget director — onboard our editorial team this past October. The timing could hardly have been better. David’s unique editorial space is covering the end of what he calls the “Bubble Finance era”. An era that began its exit on December 16th, when the Federal Reserve raised interest rates for the first time in a decade. Now all of that has long disappeared. The Fed has turned the capital markets into casinos where speculators and gamblers are showered with ill-gotten gains. Financial operators strip-mine the Main Street economy. I call this the “Age of Bubble Finance.” And I’ve been working with Agora Financial to produce a publication called Bubble Finance Trader that helps you make trades in this unique environment in transition. Right now we’re distributing it to only a select group of readers as a beta-test to get feedback. It is not merely that the financial markets have drastically changed — even from where they stood in the mid-1980s when I was working in the Reagan White House. Washington’s crony capitalist bailouts and the massive flow of cheap money and artificial credit from the Fed have wholly corrupted them. In this crazy Fed-distorted market, the first thing you should focus on is capital preservation. Rule No. 1 is don’t lose money. This is more important than capital gains when government and central banks have gone rogue and have chronically violated every known rule of fiscal rectitude and sound money. That means getting out of harm’s way in all the financial markets — debt, equity, commodities and derivatives — because when the big correction comes, they will all experience a thundering collapse. The second thing you should be aware of is that short-term liquid investments and cash are not as bad as their microscopic yields imply. The 20-year worldwide central bank credit boom has generated vast overinvestment in mining, manufacturing, transportation and distribution capacity worldwide. But now that the credit inflation is reaching its outer limits, and we are entering what I described as the “crackup” phase. During this phase, the forces of global deflation will drive down the price of goods and many consumer services as well. When the next crisis fully materializes, cash will be king. It will buy more everyday goods and services and will have command over drastically marked-down financial and real estate assets of every kind. 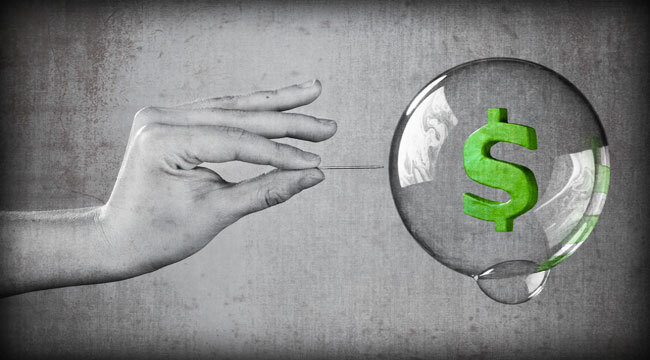 The third thing you should know is that the impending collapse of the global central bank credit bubble will generate unprecedented volatility and drastic movements in asset prices of all kinds. On the wealth-building side, you should consider deploying your discretionary capital — money you can afford to lose — by shorting vastly overvalued stocks such as Tesla. This could reap huge rewards in the next crash. I’ve already shown Bubble Finance Trader beta-testers a specific way to do this. And when we release our research to the public, you’ll have the chance, too. On the wealth preservation side, you should buy the one asset that will be left standing tall when the central bank money printers finally fail: gold.